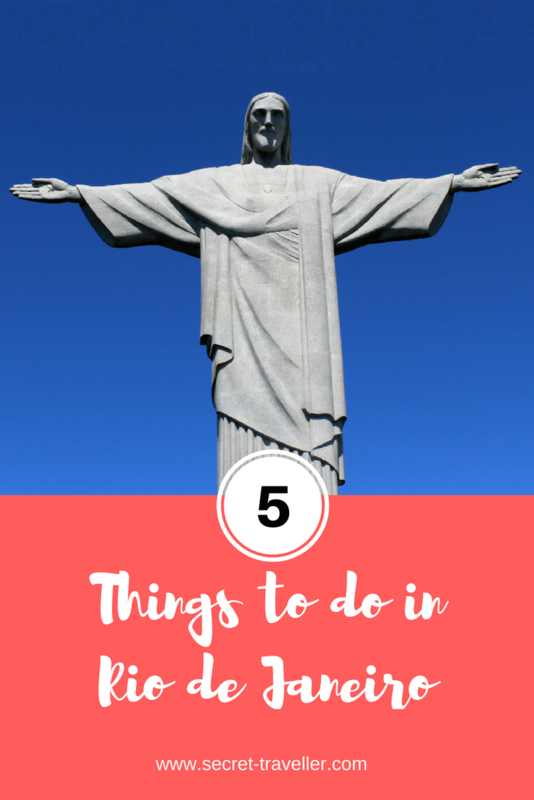 Rio de Janeiro was the first stop of our 5 month South American trip and I’m so glad we stayed for 2 weeks because there is a lot to see, plus we could take our time to get to know the city. But we also realised that the weather can be very unpredictable (yes, it can rain a lot in Brazil!!!) and you do need a clear day to get these picturesque views from the Sugarloaf Mountain and Christ the Redeemer. Besides the must see attractions, we’d wanted to do some hiking and explore all the different neighbourhoods. We’d first thought about booking a guided tour, but realised that you can easily get around by public transport for less than £1 per ride, which means more freedom but also more money to spend on delicious Brazilian food. Tip: A short walk away from the cable car station is the beautiful Praiha Vermelha. It’s a small but very quiet beach that is perfect for a chilled afternoon in the sun. The Morro Dois Irmãos (Two Brothers Mountain) offers another beautiful view over Rio but this time, it involves some hiking. The two iconic mountains are at the end of the Ipanema/Leblon beaches and look almost impossible to climb. We took a taxi to the start of the trail at the top of Vidigal and began the 50 minute hike. The climb was very steep at times and I needed a few breaks to catch my breath. 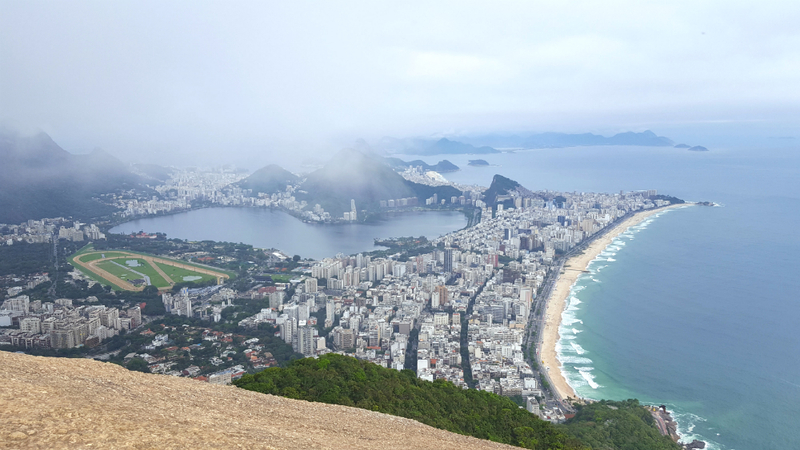 Between the humidity and the climb, we got a little sweaty but it was worth it, not many people were there and we got treated to some unbelievable views over Rio. Make sure do go on a nice, clear day; we had lots of clouds that made Rio disappear from time to time. The famous Christ the Redeemer is visible from almost every corner of Rio but it’s still worth getting to the top as this is the only way to get a close up view. We’ve picked a sunny day and got an early bus at 9am to avoid the afternoon crowds. 1 hour later, we got our first glimpse of him in his full glory. After getting the almost obligatory photo taken with our arms out like Christ the redeemer, we soaked in the panoramic views. Although we got there quite early, it already felt a bit cramped and people were fighting for the best picture. It’s super popular but you just can’t visit Rio without coming here. This neighbourhood is on top of a hill and is known for its narrow cobblestone streets. We took the historic, yellow tram to the top that runs between Centro and Santa Teresa. The tram passes over the Carioca Aqueduct before it drives through the winding streets of Santa Teresa. 10 minutes later, we arrived at the final stop and explored the very vibrant area and its street art, cute restaurants and cafés. I found this neighbourhood very calm and loved the colourful streets and viewing points from where you get more amazing views over Rio. 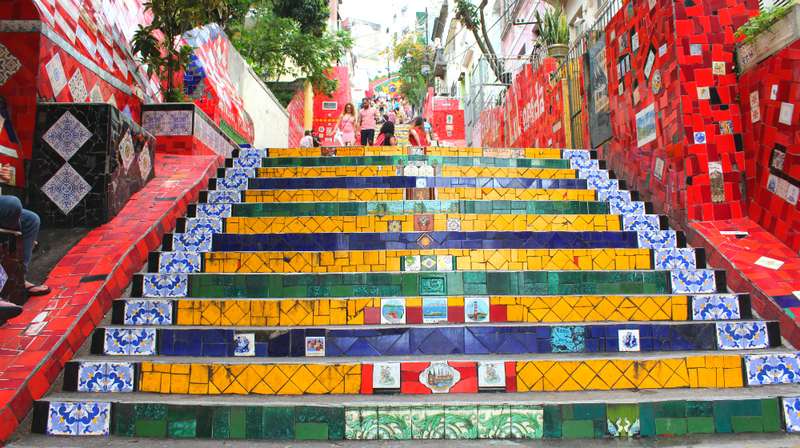 Escadaria Selarón, Rio’s world-famous steps are located between Lapa and Santa Teresa. They were only a short walk away from our apartment in Rio, so we went a couple of times. Jorge Selarón, a Chilean artist, who lived in one of the flats next to the 215 steps, started decorating them in 1990. Today, they are covered in over 2,000 colourful tiles and look absolutely amazing. Unfortunately, Jorge Selarón died in 2013 (he was found dead on the steps) but his beautiful work lives on. Rio is a very colourful and vibrant city, full of beautiful views and friendly people. We’ve had an amazing time and I’m very grateful that I could call this city my home for 2 weeks. Mucho obrigada Rio! Have you been to Rio? What are you favourite things to do? I really want to visit Rio and sometime pretty soon. It seems like a fabulous trip of yours. It is a beautiful city with so much to offer. Hope you can visit one day! Never been to Rio but it’s on my bucket list! 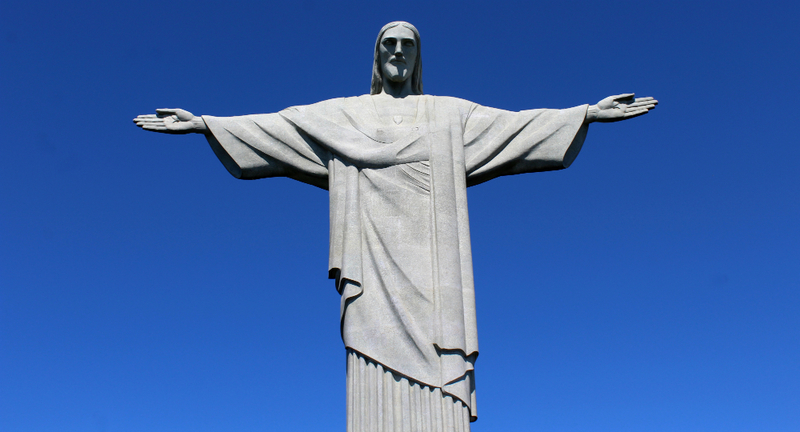 I’d love to take my picture with Christ the Redeemer! I didn’t know about Santa Teresa or the Selaron Steps! I would love to go to Rio and visit all 5 of these places – Rio looks so stunning. Did you feel safe there? I’ve never been to South America. Rio is really a beautiful city and I always felt safe. I think as long as you don’t show off your valuables, you won’t have any problems. Hope you get a chance to go very soon! I agree, I spent two weeks in Rio too and i’m glad I did – although I could have happily stayed another two weeks! I’m glad you have Santa Theresa on the list. It was my favourite place in Rio but it’s often overlooked. The streets are beautiful and it has amazing views over the city! Rio is an amazing city and I could have easily stayed there longer too. There’s just so much to see and do! I really liked Santa Theresa too – luckily it was very close to our apartment, so we could explore the area a bit further. Those Selaron steps are so vibrant, and what a cool history! I love finding cool street art when I travel and would love to visit Santa Teresa! I think I’d also like to try the hike up to the first platform at Sugarloaf Mountain. Hoping I get to go soon!! Did you know that Rio harbor is a wonder of the world? I’ve wanted to visit Rio for absolutely ages and you’ve just made me want to go even more! Amazing images! Rio has been on my list for such a long time. I hope to get there soon!! Amazing post you are posting here…….